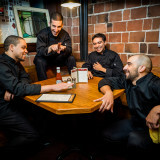 Just beyond the elegant dining room of an Upper East Side restaurant, four busboys angle for shifts, pray for tips, and cling to dreams of life beyond their dingy back-of-house grind. Expertly juggling delicate entrees, fussy customers, and beer-swilling line cooks, the young men face off with management and each other. As tensions reach a boiling point, how far will each of them go to see his own mañana come? Wednesdays through Saturdays at 7:30 p.m., Sundays at 3 p.m.
On November 6, join us for a special talk-back with Elizabeth Irwin, playwright of My Mañana Comes. Immediately following the performance, Ms. Irwin will sit down with the audience and discuss major themes of the work as well as her experiences in writing. Can’t make it? Don’t worry, the whole talk-back will be recorded and featured on our blog at www.artswest.org! Let’s talk about the future today. Throughout the production of My Mañana Comes, artswest is hosting events to talk about immigration reform and the living wage. Sunday, November 15, join ArtsWest and our special guests for a panel discussion of immigration reform and the fight for a living wage, some of the major themes of My Mañana Comes. The discussion will begin around 4:30 pm, immediately following the performance. Details on panelists to come soon. This event is free and open to the public. Please RSVP below. Join ArtsWest for our first-ever Twitter Q&A, Thursday, November 12 @ 3 pm! Use #mañanatoday to chime in! This Twitter Q&A will bring arts and advocacy together for a cross-sector discussion about the fight for a living wage and immigration reform. Use #mañanatoday to explore the major themes of our upcoming production of My Mañana Comes. Prepare to hear from some of Seattle’s brightest minds in the arts and social justice fields – all within 140 characters per tweet. Make sure to follow @ArtsWestSeattle before the session begins and keep up to date with event info through our Facebook event page here. Made possible by the generous support of The Satterberg Foundation.